San Diego Stadium, with a seating capacity of more than 30,000, was constructed for the 1915 Panama-California Exposition. The stadium was one of the crowning achievements of Charles and Edward Quayle and their partner Charles Cressey. In 1913 San Diego voters had approved issuing park improvement bonds totaling $850,000. $135,000 of those bonds was set aside to build San Diego Stadium east of the high school. The design was monumental. Greek columns towering over the San Diego skyline framed the entrance near present-day Russ Boulevard and 16th Street. It was the place where many notable persons made appearances including President Woodrow Wilson, Charles Lindbergh and Babe Ruth. In 1961 the stadium, which had been renamed Balboa Stadium, became home to the San Diego Chargers. And in 1965 The Beatles played to a full house. The massive stadium was demolished in 1979. 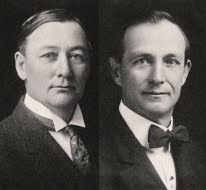 Quayle Brothers and Cressey also designed the Salt Lake Route and Union Pacific Building for the Exposition.